The popularity of the Chichester Corporate Challenge road races shows no sign of fading. More than 860 runners completed the course in a seven-race programme and the number of spectators seems to be getting larger year by year. The event is in its 27th year, having been started as a seniors-only competition but having grown steadily to today’s levels, which this year saw the juniors outnumber their elders. The seniors had 82 complete teams in three categories with 42 in the corporate category. In the A race for faster runners, a group of about a dozen formed in the first lap of the four-lap 4,500m course and there were still half a dozen together at halfway. A strong surge over the final lap saw Ed Dodd of the local Russell Giles Partnership stride clear of Jack Woods from Worthing Hares and Matt Gordon, running for Chichester-based team Linn Systems. All three broke the coveted 14-minute barrier with Dodd winning by seven seconds in 13.46. In the team event, former winners Dstl Portsdown had a four-second margin over RGP with an aggregate time of 61min 41sec from their four runners. In the mixed sports category, Chichester’s combined squad of under-17s and under-20s, running as Conrad’s Lads, led home by Leo Stallard, had an advantage of just over a minute from Worthing Hares and at 59.05 were the only team to break the hour barrier. First woman home was last year’s series winner, Rhiannon Dunlop, who at 15.28 was nearly a minute clear of Alice Wright from Chichester University, with Lucy Thraves third. 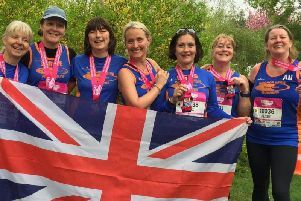 Team-wise for the women, Dstl made it a double in the corporate standings to lead WSCC by nearly three minutes while Chichester University Students had a nine-minute advantage in the sport teams rankings. The evening started with the primary-school races and the boys had to be split into separate Year 5 and 6 races to accommodate the numbers. The fastest three were all from Year 6, with Rufus Edsell from Hollycombe emerging as the winner in 4.51, just in front of Samuel Tonks from North Mundham and Joshua Dunne from Westbourne Primary. All three were under the five-minute barrier for the 1,400m two-lap course. Team-wise North Mundham, at 15.38, had a slim ten-second advantage over Westbourne with Aldingbourne a single second further back. In the girls’ race, the top three finishers were all from Hampshire, with Hattie Bond from Herne Primary winning by 16 seconds in 4.54 from Florence East from Lyndhurst and Kitty Bryden from Newbridge. Florence Ingram was fourth to give Jessie Younghusband a convincing 45-second lead in the team standings from Westbourne with St Richards a further second back. The secondary girls’ race over three laps had all four age groups together and in-form Year 10 Maggie King from Bishop Luffa led the field from the start to finish in 7.16. She was chased hard at the end by Year 8 Olivia East from Mayfield, who had narrowed the gap to a single second at the line. Eva and Isobel Buckler from Bishop Luffa were followed by Cerys Dickinson from St Philip Howard to make it four Year 8 runners in the top five. Natalya Smith from Noadswood just won the Year 9 race on the line from Nina Moranne from Bishop Luffa with Nicole Boltwood from Felpham five seconds behind. Tilly Russell-Stoneman from Midhurst RC was first Year 7 to finish but second-placed Evie Pickford of Bohunt led her team to the top of the standings while Bishop Luffa dominated the other age groups. The boys’ race saw the Year 9 and 10 boys running over four laps, while the Year 7 and 8 stop after three. It was no surprise to see Sussex under-15 cross country champion Liam Dunne at the head of proceedings, running for Bohunt in Year 10. Two scorching laps of just over two minutes each brought Dunne to halfway at record-equalling pace but, with one eye on the national cross-country championships, Dunne eased off to win in 8.26, still one of the fastest times on record. James Gardham from Bishop Luffa also broke the nine-minute barrier with George Ashby and Leon Heard under ten minutes. The top two Year 9 runners, Douglas Smith and Adam Robinson, from Bishop Luffa, ran stride for stride to dip under ten minutes and enable Luffa to head the combined Years 9 and 10 team table from Chichester High School. Over the three-lap race Year 7 Fionn O’Murchu again got the better of club-mate Year 8 Joe McLarnon from Ditcham Park in 6.55 and 6.58 respectively. Harvey McGuiness earned Bishop Luffa second place in the Year 7 team standings behind St Philip Howard, who won the Year 8 race in front of Chichester High School. The second race night is next Wednesday (March 7). Organisers can take a few new entries on the night – report to their HQ in North Street.